To run a comparison between two Excel workbooks, Microsoft Spreadsheet Compare opens those files behind the scenes in Excel. 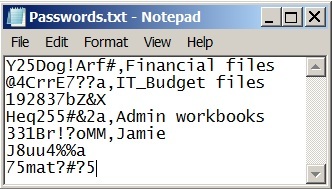 If your organization uses password-protected files, you may want to build a list of these passwords in a text file. Then, you can import the text file so that Spreadsheet Compare can scan the list of passwords to find ones that work on the protected files. 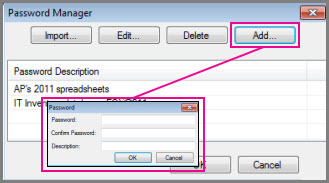 If you want some background about storing passwords before you go on, read Manage passwords used to open files for analysis and comparison. Keep in mind that a password doesn't have to be associated with a particular file. The password list is simply a list that Spreadsheet Compare reads until it finds a password that works on a file it's trying to open. 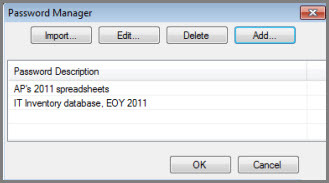 In the Password Manager dialog box, click Import. Browse to your text file, click Open, and click OK. If you included a description for a password, it will appear under Password Description. If a password contains a comma, you can't import it because the comma will be seen as the separator between the password and its description. If you have a password containing a comma, you'll need to enter it manually in the Password dialog box by clicking Add. After you've finished importing your passwords, it's your choice whether to hold onto the text file, as it might come in handy later for you. But be sure to save it in a secure place, as you do with any passwords you write down or otherwise save.